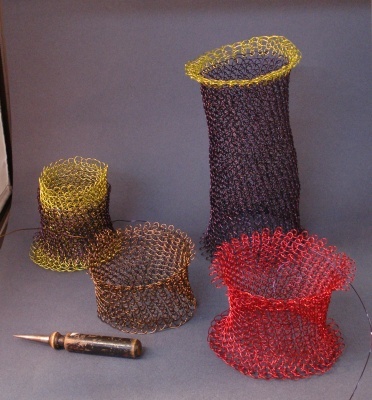 I've been weaving wire for over 20 years, all freehand, or basketweaving, or on a rigid frame I make like a bowl form. I've never attempted to weave wire on a loom nor do I want to. I like to weave wire in a 3-dimensional format. Last year, I had an idea to knit a dress out of wire ( yes, you read that correctly) while I was weaving my copper bustier and hat that was on display at the Annual Craftsmen Fair at Mt. Sunapee Resort, NH last year. I started knitting the bodice back in March and finished it in late April. I started knitting a sleeve to go onto the bodice, and as you can see, it's the tall dark purple tube with lime green edging. I figure, I'll either cure myself of knitting wire or love it even more. As it turned out, I got very hooked on knitting wire. It's done by make a smaller loop, threading it thru an existing loop and enlarging the smaller loop to make it the same size as all other loops. The little funny-looking tool at the lower left side of picture is an old awl I found in an antique shop, and it's perfect for making consistent loops. So far, I have 3 knitted bracelets and one sleeve. It doesn't take as long as it looks, and I can do it by feel, even though I check each loop quickly to make sure I'm not dropping a stitch. You can knit wire with knitting needles, but it has to be 26g.or thinner wire, and it's very loose, which I find it is untidy. A crotchet hook can be used as well and there are artists who do amazing work with a crotchet hook, but I find I fight the hook a lot. A simple awl works best for me since it's used mostly to make the loops a consistent size. There's about 4-6 ways to knit wire, so you have to find one method that works best for me. I like to do the Viking chain method best. Now I have to figure out how to attach sleeve to bodice and then finish the skirt, which will be hundreds of wire loops that attach together to make a flexible mesh skirt. I wanted to change the texture so that the skirt and bodice are slightly different. I need a mannequin to put the bodice on so I can do the skirt. Where can I find one? I'll see if I can borrow one.